For some time now, the trenches of Battlefield 1 have been capturing the most authentic aspects of World War One. Snipers on horseback, soldiers leaping into planes from the ground, and medics that don’t heal people. But the most authentic and real to life thing might be the flying tanks. Just like the old days. 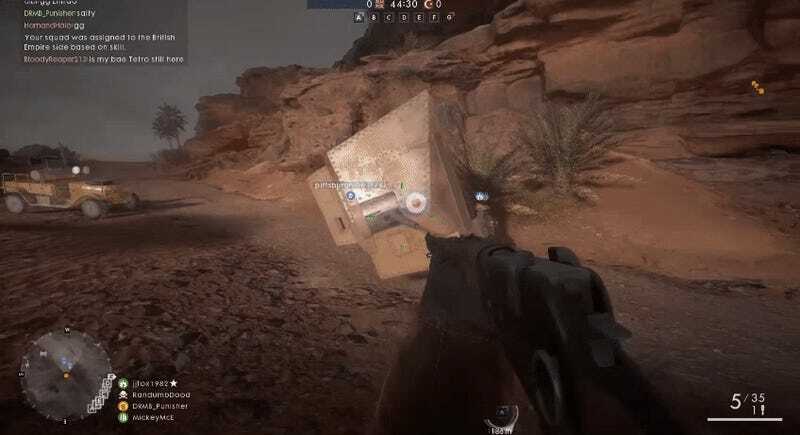 Tipping a landship or other tank on its side seems to completely trick the game’s physics, leading it to overcompensate and instead send the tank upwards into the sky. Battlefield 1's tanks have a history of surprising lightness. In the alpha build, it was possible to launch them spinning through the sky with a well positioned explosion or cannon shot. That said, I’m completely not sure this is a glitch. I’ve been assured by absolutely no one that this is an accurate representation of how tanks use to work before science was invented by Albert Einstein in 1921. It remains to be seen if DICE will eventually make changes to tanks. For now, doughboys and gals should keep their eyes on the skies!